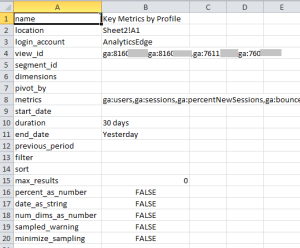 Use this Analytics Edge wizard to select the Query Configuration Worksheet for Bulk (multiple) Google Analytics queries. Each column on the query configuration worksheet identifies a different query to be run and the worksheet / cell location where the results should be written. 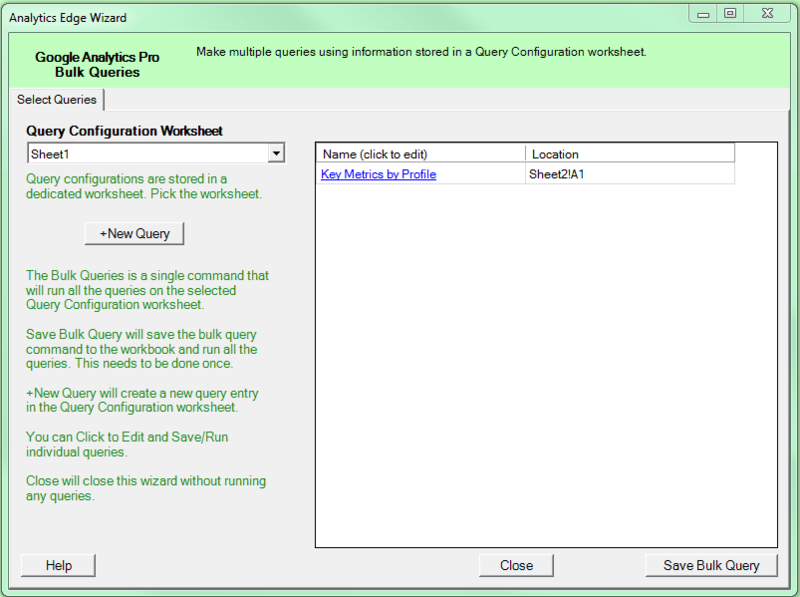 + New Query – create a new query using the wizard. Queries can also be created manually in the worksheet. Name (click to edit) – lists the existing queries. Click on the link (name) to open the query for editing using the wizard interface. Queries can also be edited manually in the worksheet. Location – identifies where the query results will be written, in the form of ‘worksheet’!cell. The Query Configuration Worksheet contains a separate column for each query. 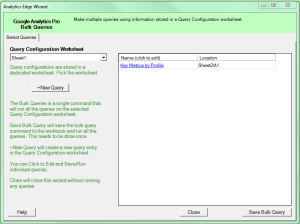 You can create and edit the queries using the wizard, or you can manually edit the worksheet as you require. Cell values can be manually entered or you can use an Excel formula (such as =TODAY()-1 for an end date). Note that if you use formulas, the wizard will not modify them if you edit the query using the wizard interface. To understand what values can be used for each parameter, use the wizard to construct your query. 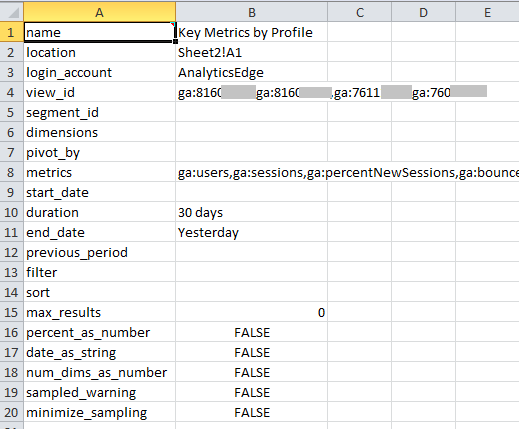 Some of the more advanced parameters may require understanding of the Google Analytics API.